Customer experience design is one of the most powerful accelerants of business strategy a leader has. It provides one of the most compelling answers to the question: do we matter to our customers? And yet, far too many organizations leave too much on the table by failing to intentionally align people and strategy from the top down to ensure this happens. 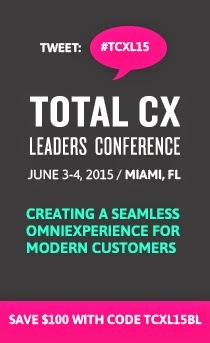 At the Total Customer Experience Leaders Summit you will learn how to increase your organization's relevance by creating an intentional customer experience that aligns your organization from the top down. Like many retailers, REI faces the challenge of becoming a more customer-centric organization, one that connects all aspects of the customer's experience. For the last two years, REI has been developing a comprehensive customer measurement program, building from a blueprint, and including management interviews, qualitative and quantitative research, action planning, linkage and goal-setting. This presentation will describe that journey and provide attendees with a process for developing their own customer experience measurement program. Joining Anne-Marie at the event is an impressive line-up of customer experience professionals sharing their own real-life stories. AAA NCNU, AARP, American Family Insurance, BMO Financial Group, Boston Symphony Orchestra, Burke, Inc., Citizens Financial Group, Dunkin' Donuts, Experience Engineering, Feltz & Associates, LLC, Forrester, GfK Custom Research, GfK Customer Research, Hunter Douglas, Indiana University, Janet LeBlanc & Associates, JoAnna Brandi & Company, Inc., Maritz Research, Porter Airlines, Prophet, Rockwell Automation, Starwood Hotels & Resorts Worldwide, The Hartford, Time Warner Cable and USAA.